The structure located at 18 Holland St. West is a unique, infill building. It was built in the Boomtown style around the 1890’s on a narrow lot that was originally a laneway the two adjacent buildings. It had a side entrance to the Queen’s Hotel so that teamsters and buggy patrons could get their drinks from the Queen’s after work. The owner of the building erected at this site only has the title to the ceilings, floors, and front and rear walls. The side walls belong to the neighbouring buildings. 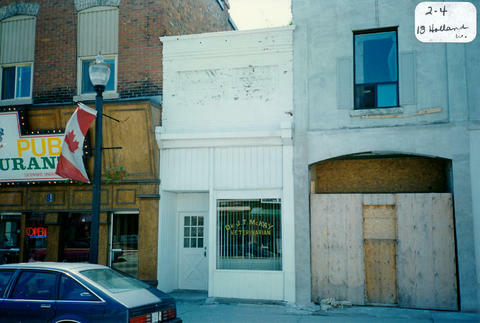 The one-storey storefront has a ‘false’ façade and a narrow, rectangular plan with an asymmetrical organization. An asymmetrical façade with a ‘boomtown’ front was common to small, rural, commercial buildings. The flat roof (built-up tar and gravel) with a high parapet was intended to make the façade appear more imposing and substantial. A recessed, grade-level entrance provides shelter for the doorway. The original entrance had a transom light over the door which was later covered with solid panelling. The entrance door is not original. A large, storefront, window bay dominates the façade at street level and maximizes the amount of area available to display merchandise. The window is not original. When the building was inventoried in 2000, a decorated parapet had a double band of brick corbelling near the top with two recessed panels of decorative brick below. The building had masonry construction with brick cladding and roof spans between the exterior side walls of the adjacent buildings. The panelling above the front window replaced the original signage panel. It noted that and the original brick would have been unpainted and that the building is in good condition.